05-28-12: TEXAS We started the day in Salina, KS and progressed towards northwest TX where SPC had a Slight Risk for severe weather in place with a 30% hatched area for significant hail. With dewpoints in the lower 60s, better upper level forcing well to the north, and fairly weak southeast surface winds, we figured that storms would be fairly high based and that this was going to be mainly a structure type of day with damaging winds and big hail the main severe threats. As mentioned, higher jet level winds on this day were well to the north as a trough had established itself near MO/MS Valley regions, and there was ~55 kts at 250 mb as well as 30-40 kts at 500 mb nosing into the area by 00Z. A slow moving cold front was the trigger for supercell development as an area of low pressure moved northeast along the boundary towards Crowell, TX by late afternoon. Our route took us from Oklahoma City southwest through Wichita Falls, TX and on Hwy 277 towards Seymour, TX. At 2:54pm, SPC issued a Mesoscale Discussion for northwest TX into OK along the boundary. This discussion noted the moderate to strong instability as 2500-3000 j/kg of MLCAPE was present along and south of the boundary with little to no cap left and towering cumulus taking place. There was also 30-40 kts of deep layer shear present and lapse rates around 8C/km, favorable for supercells to produce very large hail. A severe thunderstorm watch soon followed at 3:50pm for the area as storms began to fire along the boundary. Our storm we first targeted was northwest of Seymour towards Crowell as this storm was right ahead of the low and looked the healthiest on radar. We progressed up FTM 1919 where we ran into a number of other chasers surrounding this storm in the middle of nowhere. It was a good feeling to be out there and experiencing the storm away from towns and out in the open. 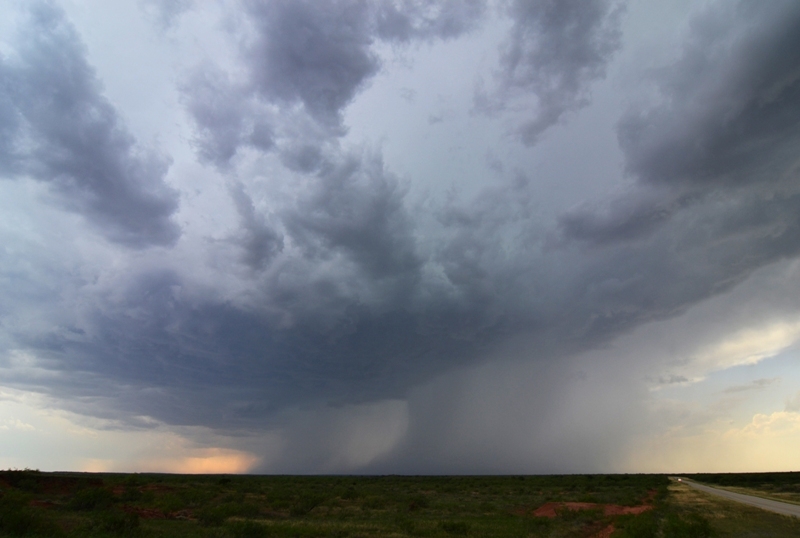 Upon reaching the storm, we watched as it dumped several enormous hail cores and likely a wet microburst or two. We were able to sit and photograph this storm for a good half hour, getting some good cloud-to-ground lightning and structure shots, until the storm kicked out a big RFD plume and started to speed up/catch up to us. As we headed back towards Seymour, the VIL’s were maxed out with GRLevel3 projecting 4” hail! Definitely something we didn’t want to mess with. At that time the storm to the east was looking better with a well defined lowering, while our storm was turning into a massive HP hail machine. We progressed southeast on Hwy 114 towards Olney to stay between the two storms and give us options but, as we did, everything began to consolidate into a linear mess and eventually an intense bowing line picking up speed towards us. 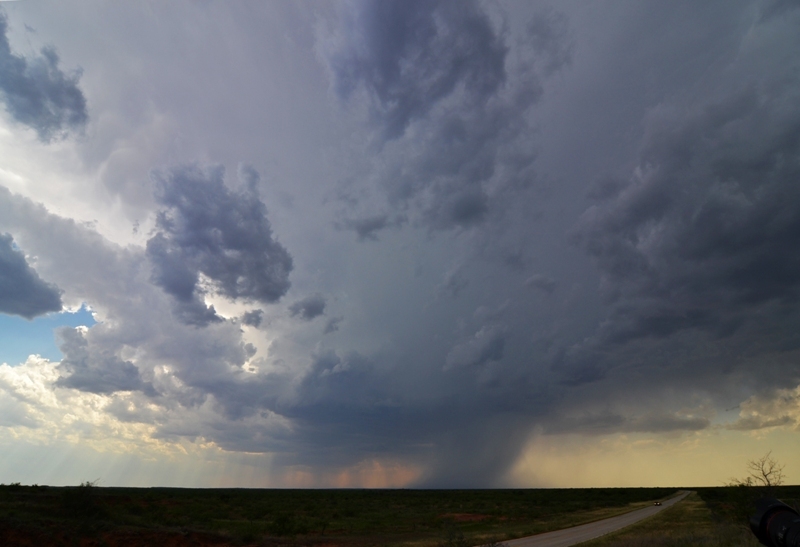 In order to get out of the way, we charged west towards Throckmorton but quickly realized we would not beat the massive hail core to town, so we headed south on FTM 578 to buy some more time. Near Woodson, the structure of the storm was awesome with a green/orange glow and an impressive sharks teeth shelf cloud. Realizing we were never going to beat this storm, we tucked the vans up against a shed in Woodson to get some protection from the hail/wind. We expected to be bombarded with hail, but instead got none at all as the core barely missed us. There were torrential downpours and high winds with some very close CG lightning that hit a church steeple twice, which was only ¼ mile away. The core of the storm passed over and we went to leave, but the middle van became stuck in the mud and Van 3 almost got stuck as well! With the help of the great volunteer fire department of Woodson, the van was pulled out of the mud and we were on our way back to Wichita Falls for the night, while viewing an incredible backlit storm at sunset as the line had moved off to our southeast. Supercell beginning to develop on the triple point southeast of Crowell, TX. Supercell developing rapidly with two well focused hail cores and great storm structure. Large rain and hail core as the storm becomes more intense, producing numerous cloud to ground lightning strikes. Closer view of the lightning strike in the previous photo. Another strike as the storm draws closer. Interesting base forming on the supercell between Crowell and Seymour, TX. Massive hail core behind the base. Strong inflow was occurring into the storm at this time. The gang from Silver Lining Tours documenting the storm. This is the only time we saw rotation in the base of the storm in its feeble attempt to produce a wall cloud at the front. 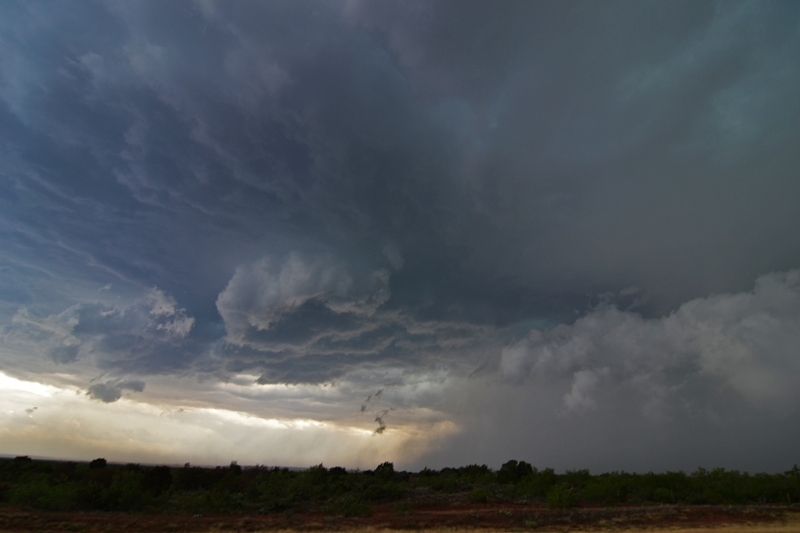 Condensating, cold outflow scud occurring on the right side of the image as the hail core approaches. Shelf cloud on the monstrous HP supercell to the north of Woodson, TX.